A STERLING victory by Bendigo Pioneers over Sandringham Dragons has helped the Pioneers move within percentage of a top eight spot. Bendigo led throughout the game, but it was a six goals to three third term which saw the Pioneers move 19 points clear, before holding on in a dour final term to win 11.13 (79) to 8.10 (58). Darby Henderson led all comers with 35 disposals, eight marks, five clearances, six rebounds and three inside 50s, while Angus Schumacher (28 disposals, eight marks, four clearances, four inside 50s and five rebounds) and Matt Harvey (23 disposals, seven marks, five inside 50s and two goals) were also impressive. For the Dragons, Hamish Brayshaw had another big day across the ground with 32 disposals, four marks, five tackles, eight clearances, seven inside 50s and four rebounds. Fellow over-ager Ari Sakeson also racked up 30 disposals and 11 marks, while Quintin Montanaro had 25 disposals, nine marks, five inside 50s and kicked a goal. A strong third term by Oakleigh Chargers put their result beyond doubt against Greater Western Victoria Rebels. The Chargers booted six goals to zero in the premiership quarter to lead by 45 points at the final break, before holding up the Rebels with the breeze in the final term, to win 12.10 (82) to 6.6 (42). Jack Higgins collected 28 disposals, four marks, four clearances and booted a goal, while Louis Cunningham continued his good form with 24 disposals (16 contested), 10 clearances, 10 tackles, five inside 50s and a goal playing further up the ground than his typical defensive role. Sam Harte had 27 disposals, four clearances and four inside 50s, while Jordan Troiani laid seven tackles to go with his 21 disposals, seven inside 50s and two goals. For the Rebels, Callan Wellings laid nine tackles from 19 disposals in defeat, while Jordan Johnston (16 disposals, five marks and five clearances) and Matty Lloyd (16 disposals, eight tackles and nine rebounds) were also in the Rebels’ best. Murray Bushrangers held off a determined Calder Cannons outfit during the Bushrangers’ 19-point win over the cellar dwellers. Leading by five goals at half-time, the Bushrangers had their work cut out for them in the third term as the Cannons booted six goals to two, clawing their way back to within 10 points. The Bushrangers steadied in the final term, booting 3.4 to 2.1 to win 10.17 (77) to 9.4 (58). Harry Jones was busy once again with 26 disposals, four clearances, eight inside 50s and seven tackles, while Nick Richards (25 disposals, four marks and five tackles) and Ben Paton (19 disposals, four marks and five rebounds) were also important for the winners. Mitch Podhajski (24 disposals, nine marks and seven rebounds) and Ben Caluzzi (22 disposals, six marks and seven rebounds) were prominent behind the ball, while Aidan Tilley took 12 marks (three contested) from 18 disposals playing in the defensive half. Top prospect Noah Balta had 13 disposals, 19 hitouts, three clearances and six inside 50s. Eastern Ranges held on against a fast finishing Gippsland Power to record their second win over the season. Leading by 17 points at half-time, the Ranges had to battle tooth and nail in the second half as Gippsland booted six goals to four to come within two points at the final siren. 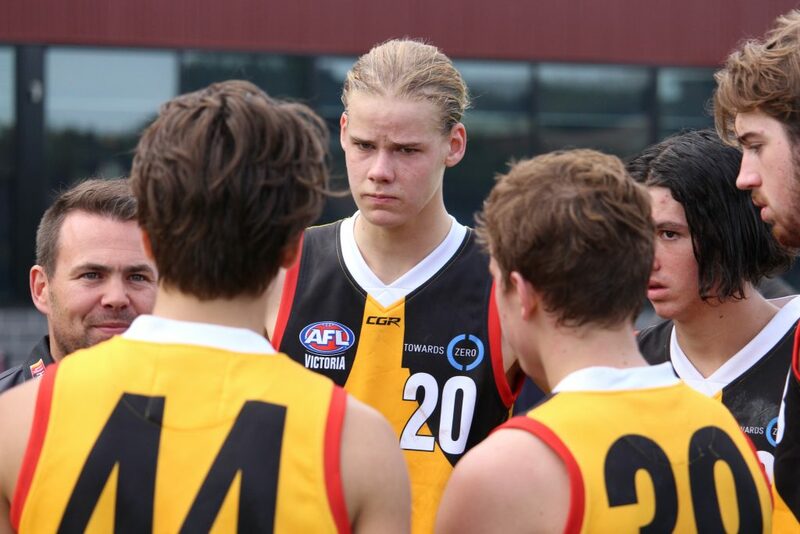 Sam Hayes’ draft stocks continued to rise with six goals and 18 hitouts for the Ranges with a best on ground performance by the big man. Others to impress were returning midfielders Dylan Moore and Trent Mynott who combined for a whopping 65 disposals, 19 clearances, 20 tackles, 10 inside 50s and two goals, while Thomas North and Jordan Lynch were also promising again. For Gippsland, Will Stephenson continues to put his hand up into draft calculations with 25 disposals, seven clearances, six inside 50s, 12 tackles and two goals. Callum Porter was just as impressive with 25 disposals, three marks, seven clearances, eight inside 50s and 13 tackles, while Aiden Quigley had 21 disposals, three marks, three clearances, four tackles and a goal. In another tight encounter, Northern Knights got up over Dandenong Stingrays by three points after an impressive final term. The Knights trailed by 15 points at the final break, but added 4.6 to Dandenong’s 2.0 to run over the top of the Stingrays 10.9 (69) to 9.12 (66). Mitch Andrews had 33 disposals, 12 marks, seven rebounds and five tackles, while Jamison Shea (25 disposals, six marks, four inside 50s, four goals and 10 tackles) and Jack Petruccelle (20 disposals, four marks, six tackles, five clearances, four inside 50s and a goal) were the Knights’ best. Nicholas Coffield booted the winning goal of the day, one of two from the Knights’ skipper, who also racked up 22 disposals and six marks. For Dandenong, Hunter Clark had a day out with 34 disposals (20 contested), four marks, 11 clearances, seven tackles, 10 inside 50s, five rebounds and a goal – but his efficiency by foot was poor. Over-ager Tom Murphy racked up 29 disposals, six clearances and seven inside 50s, while Tom De Koning booted three goals from 17 disposals. In the other remaining game, top-of-the-table Geelong Falcons got the job done against Western Jets in a four-goal victory. They did not have it all their own way and only led by six points by the final break before kicking away with the only three goals of the last quarter to win 15.9 (99) to 11.9 (75). Sam Walsh had 34 disposals (18 contested), eight clearances, eight inside 50s and six tackles, while James Worpel had his best game of the year with 32 disposals, five marks, 11 clearances, eight inside 50s, nine tackles and two goals. Bayley Cockerill also had 11 clearances and seven inside 50s from 30 disposals, while Gryan Miers booted four goals from 17 disposals. For the Jets, Nicholas Stuhldreier continues to stand up with another 34 disposals (17 contested), six marks, seven clearances, seven tackles and four inside 50s. Jaden Rice had 27 disposals, eight clearances and 12 tackles, while Matthew Volkanovski had a dominant 40 hitouts from 11 disposals in the middle.